This week's Invisibilia podcast and show explore what happens when people flip the script, responding to situations in ways that are completely unexpected. We tend to respond to aggression with aggression, kindness with kindness. Usually that works just fine. But sometimes turning 180 degrees can change the world. Think Mahatma Gandhi or Martin Luther King Jr. 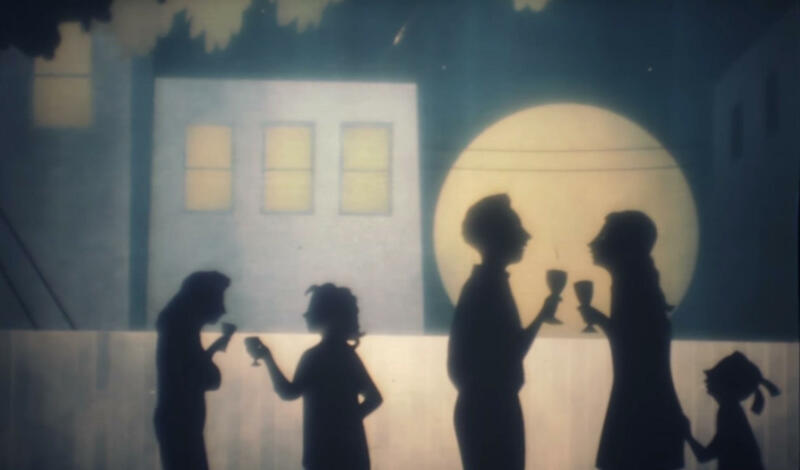 In this Invisibilia excerpt on NPR's Morning Edition, we tell the tale of a mellow Washington, D.C., dinner party that was suddenly interrupted by a man with a gun. "Give me your money," the man said. Or he would start shooting. The diners tried to persuade him to back off, but the situation was getting increasingly tense. Then a woman named Christina did something simple yet extraordinary. And that changed everything. In NPR's health blog, Shots, Invisibilia co-host Hanna Rosin explains what she found when she traveled to Denmark to check out a radical experiment in flipping the script. It involves the local police and dozens of young Muslims who were planning to run off to Syria and join ISIS. We also asked psychologist Christopher J. Hopwood to explain the science behind what happened at the dinner party. Psychologists call it noncomplementarity — responding in an unexpected way to prompt a positive response. It's used in psychotherapy, and it also can work to make relationships better in your own life. NPR's Invisibilia this week is tackling a social theory that has a kind of clunky name, which we'll hear in a moment, but, as we'll also hear, really interesting consequences. And to tell us about that, NPR's Alix Spiegel. ALIX SPIEGEL, BYLINE: This story starts in Washington, D.C., on a warm summer night. There were eight friends gathered around a backyard dinner table. They were toasting family and friendship, and everybody was having a good time. MICHAEL RABDAU: Kind of one of those great evenings, lots of awesome food and French wine, and it was like a magical night. SPIEGEL: That's Michael Rabdau. He was there with his wife and his 14-year-old daughter Khyber. And he says it was getting late, maybe around 10 p.m., when it happened. RABDAU: I was standing beside my wife, and I just saw this arm with a long-barreled gun come between us. It was as if in slow motion this hand - and then it just got really quiet. SPIEGEL: The hand belonged to a man - medium height in clean, high-end sweats. He raised the gun and held it first to the head of Michael's friend Christina and then to the head of Michael's wife. KHYBER RABDAU: Give me your money. SPIEGEL: That's Khyber, Michael's daughter. KHYBER: Kept repeating give me your money. RABDAU: Or I'm going to start [expletive] shooting. And we believed him. SPIEGEL: But there was a problem. No one had any money, so they started talking, grasping for some way to dissuade the man. They started with guilt. KHYBER: What would your mother think of you? RABDAU: And he said something like I don't have an [expletive] mother. SPIEGEL: Michael remembers thinking this is headed towards a very bad end. RABDAU: Someone was going to get hurt. SPIEGEL: But then one of the women at the table, this woman Christina, pipes up. She has an offer for the man. KHYBER: Said, you know, we're here celebrating. Why don't you have a glass of wine? RABDAU: It was like a switch. You could feel the difference. SPIEGEL: All of a sudden, Michael says, the look on the man's face changed. RABDAU: And he tasted the wine and just said, damn, that's a really good glass of wine. We had some cheese there, too, and so he reached down for the cheese, and then he put the gun in his pocket. SPIEGEL: The man drank his wine, ate his cheese and then he said something that no one expected. RABDAU: I think I've come to the wrong place, and we were all like, hey, I understand. SPIEGEL: For a moment, they all sat there together, the stars overhead twinkling, the sound of chirping insects in the night air. RABDAU: And then he said something just so strange. He just said, can I get a hug? My wife hugged him and our friend hugged him. Then he said, can we have a group hug? SPIEGEL: And so everyone got up and formed a circle around the man. RABDAU: I can't tell you how strange that was, but we all did come around him and hug him. And he said he was sorry and he walked out with a glass of wine out the gate. SPIEGEL: At the time, all they could think to do was run into the house and cry in gratitude. RABDAU: It was like this was like a miracle. It was like a miracle. SPIEGEL: But was it a miracle or is there a better word for what happened that night? SPIEGEL: Before we start, do you have any questions for me? CHRIS HOPWOOD: No, no questions. SPIEGEL: This is a professor at Michigan State University named Chris Hopwood. Chris spends his life looking at how people interact with each other. And one of the things that he looks at is called noncomplementary behavior. So the basic idea is that people naturally mirror each other, so when someone is hostile to you, you are typically hostile back, warmth begets warmth. And breaking this pattern, say, being really warm to somebody after they've been incredibly hostile to you, that is noncomplementary behavior. And according to Hopwood, it's incredibly hard to do. HOPWOOD: So if I am really nice to you and you're really cold and unfriendly to me, generally speaking, either I'll try to do something to, like, appease you and make you like me so that you'll warm up or maybe I'll respond with coldness to you because you're being unfriendly to me or we'll just stop interacting. SPIEGEL: But people do manage to sometimes behave in noncomplimentary ways. And when they do, it often completely shakes up the situation, flips the script. It happens between people, but also it can happen on a bigger level. HOPWOOD: The reason, for example, that we admire people like Gandhi and Martin Luther King, Jr., is because they were able to maintain a sort of warmth and integrity in the face of people who were being cruel to them. SPIEGEL: The march in Selma, nonviolence in India, offering a man with a gun at your head a glass of wine - those aren't miracles. They're examples of noncomplementary behavior. SPIEGEL: As for the people who had gathered around that backyard dinner table and who, through some stroke of luck or accident, stumbled on noncomplementarity that night in Washington, D.C., Michael Rabdau told me that later that evening, once everything had calmed down, he and his friends actually found the wine glass they had offered to the man. It had been neatly placed on the sidewalk in their alley, not thrown, not carelessly discarded - placed. Alix Spiegel, NPR News. MONTAGNE: This week's episode of Invisibilia has a whole hour of stories about noncomplementary behavior. And if you liked this story, we have a video version of it with shadow puppets. Yep, you can watch the group Manual Cinema bring the story to life using only light and shadows. Go to npr.org/invisibilia. Transcript provided by NPR, Copyright NPR.